There’s no reason why Mom can’t crave a taco bar—don’t forget one of these amazing margarita recipes—over quiche for Mother’s Day. I love that this spread at Wicked Tacos Online has so many easy options that can be pulled together with minimal effort. Grilled shrimp takes no time, seasoned beef can be made ahead, and verde chicken is as easy as mixing together rotisserie chicken and your favorite green salsa. Want a vegetarian option? The pinto bean recipe comes together in a snap. Lots of salsas and sauces is a good idea, too. You can get store bought or try my current favorite: ranch dressing with a handful of cilantro and some jalapeños in the blender. Yum! It’s not just for weddings! 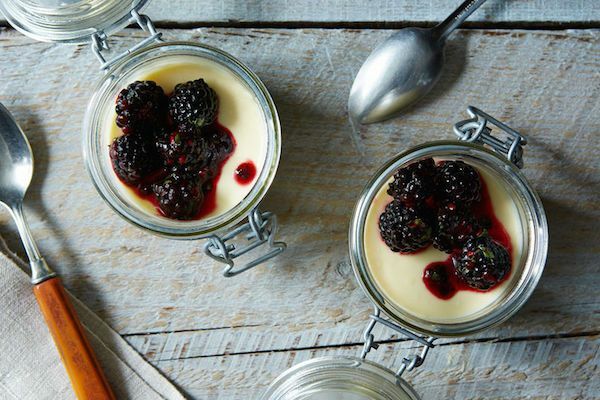 To make a fun, easy dessert bar, whip up some panna cotta or one of our favorite simple pudding recipes (which the kids will love!) and let them chill in individual jars. If you don’t have time for such things, you can always buy pudding at the store. When it’s time for dessert, set out different toppings, from chocolate sauce to fresh berries with herbs, like the ones pictured here from Food 52. It’s a light finish that is still incredibly delicious. And so, so easy. Of course, there are always cookies, cakes, or other baked goods. Mother’s Day is a pretty good excuse to splurge on a drink with more flavor. It’s so easy to set out iced tea with fruit juices splashed in for a kick of flavor; my favorite is tea with orange and pineapple juice and a bit of ginger ale. 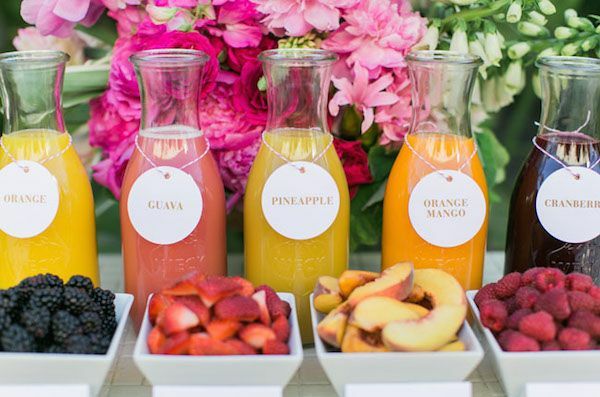 Or go classic with a mimosa bar like this pretty one with fresh fruit garnishes at Green Wedding Shoes. Isn’t that clever? Just set out a bottle of Sprite or Ginger Ale for those who don’t want the alcoholic version. An important note: Please, please, please mamas, do not stress about your food bar looking as picture-perfect as these do. Mother’s Day is about celebrating our mothers, not being queen of Pinterest. That said, if you mix-and-match your dishes, add natural touches like a cutting board, a wooden spoon, or some craft paper, and make your textures interesting with pretty dish towels or cloth napkins you can wow your guests, too without a lot of effort. Have fun, relax, and enjoy your day with your family. You deserve it! Thanks for sharing Kate, awesome ideas! I’m pinning and adding you to my favorite blogs!